If you are looking for the best place for tattoos in Denver, Mantra Tattoo & Body Piercing is your choice! Whether you are a seasoned tattoo collector or you’re thinking of getting your first tattoo, it is always in your best interest to go to a licensed tattoo shop like ours and have a professional tattoo artist design and ink it! We are Colorado’s best premiere full service tattoo shop providing professional clean custom tattoos, piercings, and a large variety of fine body jewelry and clothing. 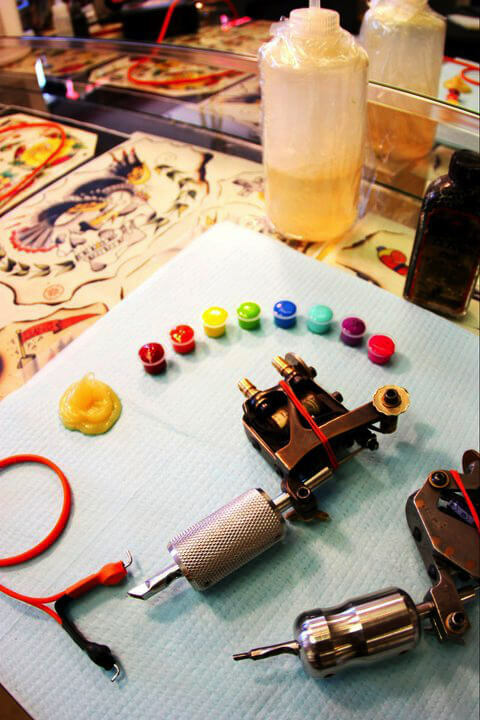 Whether you’re looking to get a giant back-piece or something small and special behind your ear, we are thrilled to help you get the tattoo you really want! At Mantra Tattoo we have the great advantage of having the ability to offer a wide variety of styles and specialties under one room, since some of our tattoo artists like to work specially on Black & Grey, Realism, Asian and New School for example. But of course, the Traditional or Old School is also part of our ample portfolio. We all do custom work, creating the design from the ideas you provide us with, until your perfect tattoo design is ready to be inked. Come visit us to get your custom tattoo designed by one of our experienced tattoo artists in Denver. Or come by to pick up a nice piece of body jewelry and get pierced by one of our professional body piercers.